A great way to enjoy the company of good conversation and friends with a waterside view, the sunroom combines the pleasure of being outside with the comforts of air conditioning and shade. 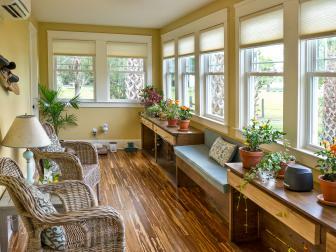 The sunroom greets visitors from the office and living room with welcoming design details, from colorful plants to comfortable wicker chairs. 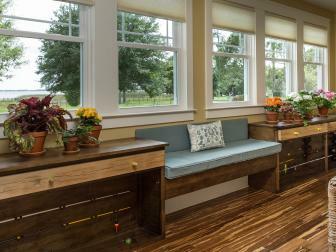 Custom-built storage showcases fishing rods, and drawers pulls are reclaimed from vintage fishing bobbers. "I like to call it my fishing room," says Blog Cabin 2014 host Chris Grundy. 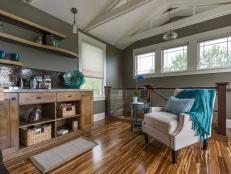 Laurie March hosts a tour of the Blog Cabin 2014 sunroom.